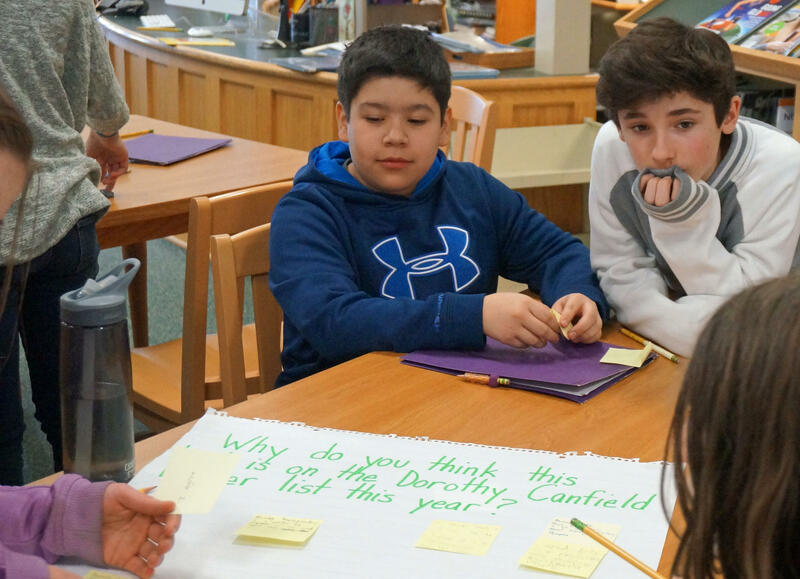 Ashley Pratt adds a sticky note to a Venn diagram that a group of sixth graders at the Mettawee Community School used to examine the similarities and differences between their school and the elementary school in the book 'George' by Alex Gino. The book's stated message is "be who you are," and the author's dedication reads: "To you, for when you felt different." Abby McChesney: Do you have a personal connection to this book? Like, do you know someone closely that is transgender or are you transgender? Alex Gino: I am transgender. And yet, this book is not autobiographical. It is influenced by my life, but I do want to point out that Melissa and I are very different in a lot of ways. And we're, in fact, different in how we're transgender. Melissa is a trans girl. She is binary, and the category 'girl' works very well for her. She loves being a girl. I'm genderqueer. Neither 'girl' nor 'boy' really has ever worked well for me. We're also different in that Melissa is growing up now, which means that she has access to language and information and ideas that I didn't as a kid. So I didn't grow up knowing that I was trans. I grew up knowing that I was different. I grew up knowing that things weren't quite connecting. But we had very different growing up experiences. 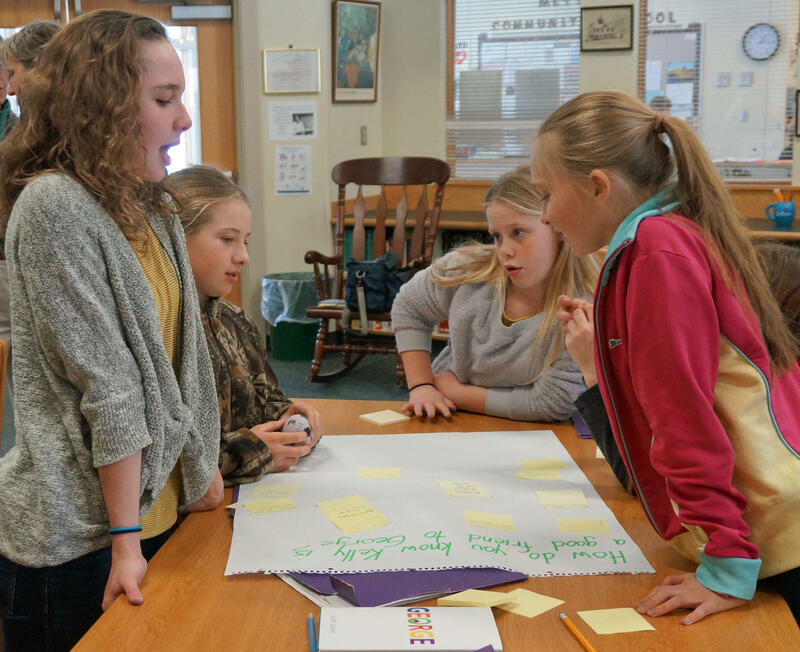 Amelia Vickery, left, and Tully Trimmer respond in writing to one of the prompt questions about the book 'George' posted around the library. Later, those questions and the answers from students would guide their discussion. Brett Rosenbauer: I noticed you would like people to use the pronoun 'they.' Why did you not make George as a character who is not either common gender? Alex Gino: I love that question. To be frank and honest, I started writing this book in 2003 and culture was different then. And it was, in fact, hard for me to envision someone who was genderqueer, or someone who is non-binary, gender non-conforming, being aware of themselves in fourth grade. And clearly, I'm wrong on that, looking at kids who are out and aware of themselves now … What I was seeing, was that it would be more likely that a trans girl would be self-aware. Harlow Rosemary Quail: I was wondering if there was a special or funny moment when you first thought of the idea for the book? Like, a special 'ding!' moment. Alex Gino: The first moment that came to me in the book is actually the very last scene in the book. And I don't want to give away spoilers, but it's a beautiful scene. It's a scene of friendship. And what I needed to do as a writer was to figure out, how could I make the rest of this story happen so that I could get to that beautiful, crystal moment at the end? And so, in fact, the very notion of the book was, itself, a 'ding' moment. School is sometimes a hard place for George to be. George is constantly being grouped with the boys – even though, inside, she knows she's a girl. And there was one routine at George's school that caught sixth grader Sophia Russo by surprise. 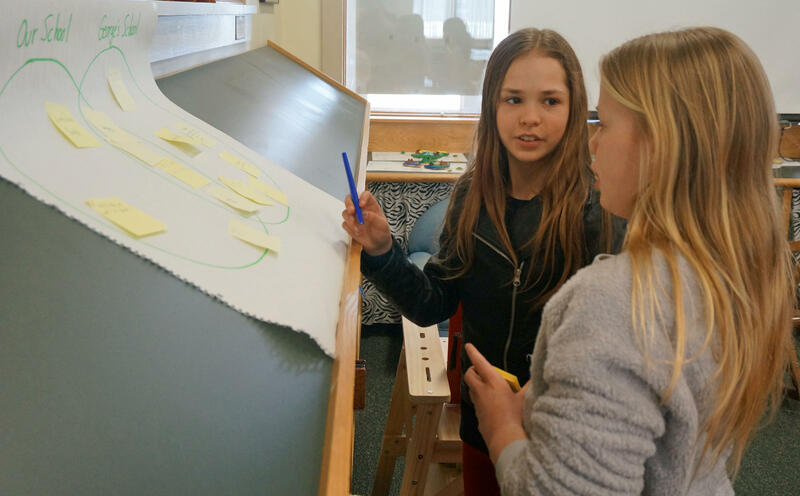 Sophia Russo: Why did you choose to make two separate lines – a girls' line and a boys' line – for when the class would dismiss to recess or just dismiss from school? I've never heard of a place that's done that, and that really caught my attention when I read it. Alex Gino: I love questions like this because I grew up with girls' lines and boys' lines. And I don’t remember a school that I didn't do that in. And so the fact that you've never heard of that tells me that we are making progress. ... I think about what my mom talks about – she got sent home from school for not wearing a skirt, in the New York City public school system. And I had boys' lines and girls' lines, but we could wear whatever we want. And now you don't know what a girls' line or a boys' line is. That's just beautiful. I just wrote it in there because that was my normative experience. To know that there are places that don't do that anymore is good for all of us. Ashley Pratt, left, and Tully Trimmer discuss whether bullying at their school and the fictional school in 'George' is different or similar. School really starts to feel unfair to George when her teacher announces tryouts for a class play based on Charlotte's Web. Some boys in George's class make fun of her for crying when Charlotte dies. Then, although George really wants to be Charlotte in the play, the teacher says only girls are allowed to try out for that part. Lexy Cary: Why did you choose the book Charlotte's Web for the play? Alex Gino: I started with Charlotte's Web as the book for the play because that's the book that I cried at in school. It's probably the most autobiographical part of the book. And the way I remember it, I was the only one who cried. And it was one of the first moments where I really felt different from the people around me … And from there, it turned out to fit in very well in a lot of ways. It's a book about friendship. It's a book about a girl in the shadows. Charlotte is a girl, she's a spider. And people don't see her as a girl. They see her as an icky thing. And it's a book about doing something good for your friends, even if you don’t get anything out of it. As readers of George will know, a selfless act of friendship to help someone who feels different is part of the message that Gino delivers in their novel, too. This installment of Dorothy's List aired on Vermont Edition on March 31, which is International Transgender Day of Visibility.